Get Three Sports Games in One! 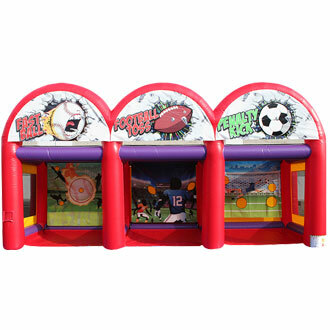 Description: One of our newest inflatables is the Triple threat sports game. It has three games that will keep you guest entertained. Fast ball, football toss, and penalty kick games are three games that can be played at once. This sports inflatable game is sure to get the crowds attention due to its large size, it measures 30ft long x 10ft wide x 12ft high. We include all of the balls required for guess to enjoy this triple threat inflatable sports game.